Visitors & relatives are welcome at Hotel Dieu Shaver – please review the information below or contact us with your questions. Hotel Dieu Shaver encourages visits from family and friends during the healing process of our patients. We know that having loved ones nearby makes patients more comfortable and speeds up their recovery. Our person-centred care culture includes an open visitation policy; however, there may be times when you are asked to leave by the health care team to protect the privacy and dignity of our patients. Patients will receive a selective menu every morning at 10:00 a.m., which will be left at the bedside for the patient or family to fill out. Menus will be picked up at noon. If required, assistance will be offered when menus are picked up. Menu selections are for the following day. Day and overnight passes are allowed with input from your Health Care Team. The focus is on ‘safety first’ and a physician’s written order. The staff must be advised of a weekend pass on the Wednesday before the weekend in question, in order to have the patient's medication prepared. Patients may be required to have their prescriptions filled by their community pharmacy. Parking at Hotel Dieu Shaver works on a pay-and-display system. Simply pay at one of the machines located at various points around the parking lots, and then display the ticket face up on your dashboard. The payment options are hourly ($2.00), daily ($6.00), or monthly ($40.00) - by coins or credit card only. Sorry, no bills. 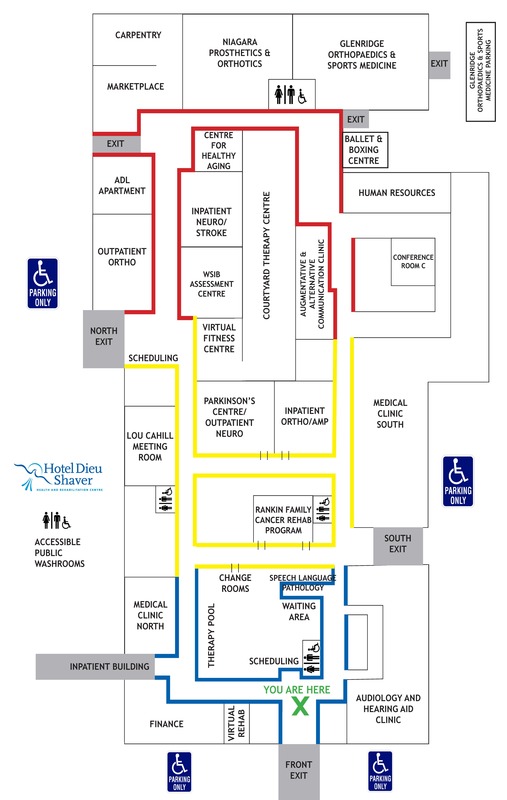 Patients and families are responsible for transportation costs associated with all external appointments not ordered by Hotel Dieu Shaver physicians. Patients who are unable to return home and who are awaiting transfer to a long-term care home or other facility will be charged a co-payment fee. The case manager will provide more information to you and your family if this applies. Family pets are welcome to visit patients, provided they are on a leash and have had appropriate shots. Hotel Dieu Shaver is a smoke-free facility. Smoking is not permitted on hospital property. This policy applies to all patients, visitors, staff, volunteers, and physicians.